Casino gambling is a widespread way of entertainment for lots of people. They love to play games and get excited. The modern casinos offer their players a wide range of casino games and other interesting activities on the casino floor. Players can try their luck by playing different games of chance and those who want to try their skills in more complicated games are free to play lots of games of skill. One of the most popular games of luck is considered to be roulette. This ancient game has an interesting history. It is highly believed that roulette game originated from the mix of two popular games at the 17th century: Italian "Hoca" game and English "E-O" game, where E stands for even and O - for odd. "Hoca" game was highly popular thought the Europe and was used to raise money for the Treasury. There were 40 cups at the table, three of them were zero and were called the house cups, and people can place bets any of them. Despite the high house edge, the game was popular. "E-O" game was widespread in England. It was played on the round table with 20 slots marked by E and other 20 slots by O. There was also 2 bar spaces that won all the bets. This game had the high house advantage but was popular among players. Roulette game came to us after many changes and transformations. Modern roulette history has started in the early 18th century. Famous mathematician of all times Blaise Pascal was trying hard to create the perpetual motion machine. By means of his experiments the first prototype of roulette wheel was invented. Pascal was constantly spinning the wheel but it always stopped. That was the great disappointment for him but the modern world would say thank you for it. The name "roulette" was taken from French and meant "little wheel". 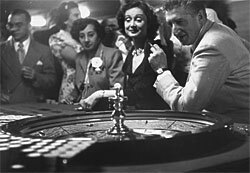 Roulette history contains a lot more secrets, however, the fact is it became popular all over the Europe and the world. The roulette wheel was considered to be one of the biggest inventions in the early 18th century as it started the era of gambling. European roulette has been played in Europe and is also known as French roulette or Single zero roulette. The European roulette wheel has 36 numbered slots and only one zero slot. This variant of the game is very popular due to low house edge. American roulette wheel was brought to the USA form Europe and became highly famous. People loved to play it in casinos and believed in their luck. The game was full of mystery. However, the casino owners decided to make their profits higher and added one more slot to the wheel. From that very moment the American roulette wheel had two zero slots: single zero (0) and double zero (00) slot which increased the house edge incredibly.